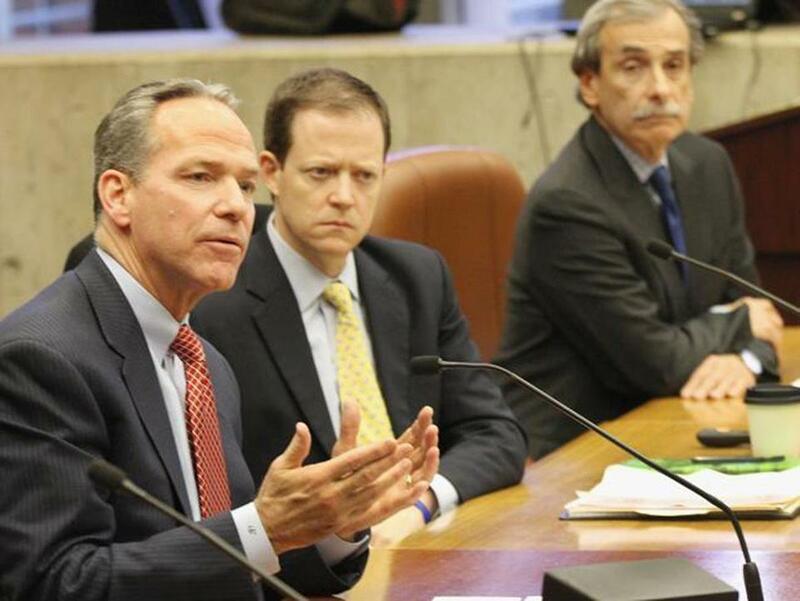 John Fish (from left), Richard Davey, and David Manfredi of Boston 2024 appeared before a hearing at Boston City Hall’s council chambers last month. When it comes to hosting the Olympics here in 2024, I’m a skeptic. But now that everyone agrees that voters will get to decide the fate of the Olympics bid, I’m a skeptic in a wait-and-see mode. The threshold question that Boston 2024 faces is crystal clear. Well before the public vote, the group will need to present a convincing plan showing how Boston (or Greater Boston) can host the 2024 Summer Games without putting taxpayers at risk. So far, what we have are professions of good intentions. “Tax dollars will not be used to build venues or pay for the operation of the Games,” Boston 2024’s new briefing book asserts. 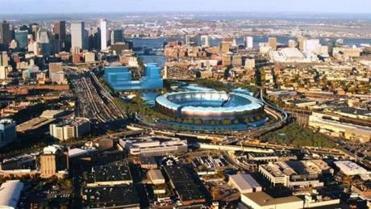 The reality, however, is that at some point, Boston will have to guarantee that the various Olympic venues will be ready. And that means the city could have to step to the plate if plans go seriously awry. Given the deep opposition to using public dollars for the Games, it’s difficult to see how Mayor Marty Walsh could put Boston in that position without an air-tight assurance that taxpayers won’t be left holding the bag. So is such an assurance really possible? Yes, declares Boston 2024, saying it will use the private insurance concepts that were part of Chicago’s unsuccessful bid to host the 2016 Summer Games. The group needs to show more clearly how the Games would improve the city and account for the inevitable costs. Maybe, but several financial experts I spoke with say it will be very difficult to insulate the public from any and all risk. Boston 2024 doesn’t, of course, have such an insurance package in hand yet. First, it needs to get the actual Olympics costs and plan nailed down. At this point, its projection of development or capital costs is $3.4 billion, an estimate that history suggests is low. The current hope is to find a private developer to build the Olympic Village and then lease it to Boston 2024 for the Games. The Olympic stadium, which, unlike the athletes’ village, wouldn’t have a secondary use, would be financed from the Games’ $4.7 billion operating budget. But it’s important to be clear-eyed about the Chicago example. The insurance component there would have covered only about $1.1 billion of the multi-billion-dollar cost of the Games, leaving the city and the state liable for other shortfalls. And according to Crain’s Chicago Business newspaper, there was no coverage against the risk that private lenders couldn’t be found to finance the Olympic Village, and none against shortfalls in corporate sponsorships. Further, a review by the Civic Federation, an independent, nonpartisan research group, included this caveat: For certain types of indemnification claims made, a $500 million deductible would have kicked in before the insurance policy paid out. So although the insurance component would have provided some protection for taxpayers, it fell well short of guaranteeing they wouldn’t face any financial risk. “Insurance can’t make things 100 percent risk free for taxpayers, because risk comes in lots of forms,” notes Mark Williams, an expert on risk management and a master lecturer at Boston University. Another possibility Boston 2024 has contemplated, though one now on the back burner, is floating bonds to finance construction, with bond insurance to guarantee repayment in case of problems. But in the aftermath of the financial crisis, there’s little appetite among insurers for insuring bonds that aren’t governmentally issued. And even bond insurance isn’t a categorical guarantee against risk, experts say. “You can build in many different kinds of protection, financial, legal, and otherwise, but at the end of the day, if those bondholders have nowhere else to go, they are going to make a claim in court against the city,” says Justin Marlowe, an expert in public finance at the University of Washington’s Evans School of Public Affairs. The city could have to step to the plate if plans go seriously awry. Now, none of this is to say the task is impossible. It is, in other words, an Olympian hurdle all its own. And one that Boston 2024 should expect will face an equivalent level of skepticism and scrutiny.